Sawflies are a group (sub-order Symphta) of insects in the same order as the bees, ants and wasps (Hymenoptera) that feed on plants. These insects can be distinguished from most other hymenopterans by their broad waist, unlike the narrow connection between the thorax and abdomen of a wasp, and by their caterpillar-like larvae. The sawflies get their common name from the saw-like appearance of the ovipositor, which females use to cut slits in stems or leaves to lay their eggs. This is a very primitive group – dating back 250 million years ago to the Triassic – and the majority (true sawflies, the Tenthredinoidea) are all herbivores, feeding on the foliage of many different plants, although one group (Orussoidea) are external parasites of wood boring beetles. There about 25 families*, with most of the 8,000 species worldwide in the family Tenthredinidae (about 5,500). The rest of this article is about the phytophagous true sawflies. The adults of sawflies tend to be inconspicuous, and look somewhat like wasps, but do not sting. They feed on pollen and nectar, so may be seen on flowers as well as their larval host plants. They are not very active, making only short flights in sunny weather, and resting on leaves otherwise. Many sawfly species are parthenogenetic; since they do not need to mate to reproduce, males are very rare even in species where males are known to occur. The adults are short-lived, usually only a few days to a week, just long enough to develop and lay eggs. The female sawfly uses its ovipositor to cut into young adult leaves, petioles or stems to deposit her eggs scattered across the leaf surface, along the edge of the leaf, or on a leaf vein, singly or in groups of 30-90 called “rafts” or “pods”. Leaf-mining species typically lay only one egg per leaf. The eggs may be inserted into the plant tissue or glued to the surface. As the eggs develop, they often expand in size so that they may end up partially projecting from the leaf surface even if they were laid within the leaf. The eggs of European pine sawfly are inserted into the needles, where they appear as evenly spaced yellow or light brown spots. The eggs hatch in 2-8 weeks (depending on the species and weather) into leaf-feeding larvae which look and often act very similar to caterpillars (the larvae of insects in the family Lepidoptera). Both sawfly larvae and caterpillars have three pairs of thoracic legs, but differ in that caterpillars have 2-4 pairs of prolegs (fleshy, leg-like projections) on the abdomen while sawflies have 6 or more. 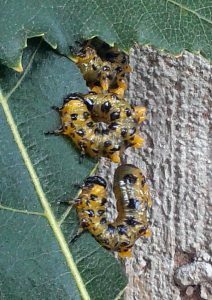 Other differences that are a bit harder to see are that caterpillars have crochets (tiny velco-like hooks) on the prolegs while sawfly larvae do not and caterpillars have 4-6 eyes on each side of the head while sawfly larvae have just a single pair of tiny eyes. A helpful identifying feature out in the field is that many sawflies are gregarious (i.e., live together in groups) and will rear back in unison when disturbed. Azalea sawfly on leaf and damage. The larvae feed and develop through 6 instars before reaching maturity. This may take 2-4 months, but often are not noticed until the last and largest instar when they are consuming large amounts of leaf tissue. A cocoon of columbine sawfly. 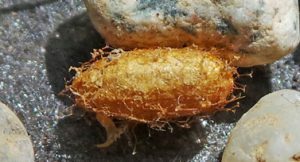 Once they have completed their larval development they either leave the host plant to pupate in the soil or spin a cocoon attached to a leaf, depending on the species. The adults emerge in a few to several months, depending on the species. Most sawfly species have a single generation per year, but some may take two years to produce one generation. Unlike many other insects which disperse as soon as they hatch, sawflies often stay together to feed in groups and therefore can quickly defoliate portions of their host plant. Some species line up next to each other with all the heads at the leaf edge as they chew away the blade. They may all rear up together or tap their abdomens up and down when disturbed. Larvae of the spitfire sawfly regurgitate a distasteful irritating liquid when bothered to deter predators such as ants. A few species are leafminers, feeding internally on leaf tissue between the upper and lower leaf surfaces. Some tropical species form large congregations on tree trunks or the ground during the day, dispersing at night to feed. 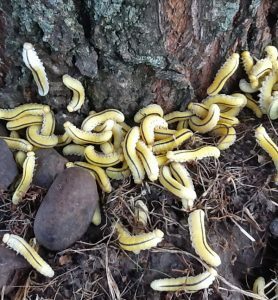 Sawfly larvae are fed upon by many animals, including some birds, lizards, frogs, ants, predatory wasps and other insects, while carnivorous mammals such as shrews and deer mice and several species of beetle larvae prey on the pupae. 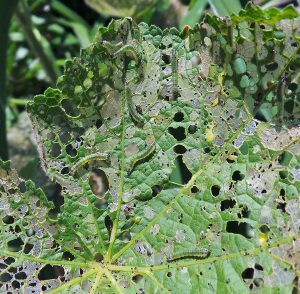 Hollyhock sawflies defoliating a hollyhock leaf. When numerous, plant-feeding sawflies can cause substantial damage in forests and landscapes. Large trees are rarely seriously injured and normally put out another flush of leaves if heavily damaged. Young trees that are completely defoliated completely may be stunted or killed. Predators and parasitoids regulate sawfly populations in natural habitats. In the landscape larvae can be removed from trees and killed by squishing or dropping them into boiling water, although this is not practical on a large scale. 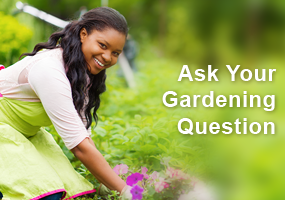 Small trees can be sprayed with a number of chemicals, if mechanical removal is not effective. 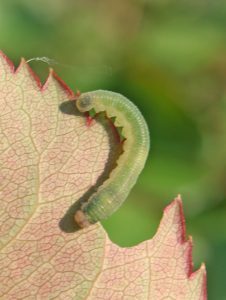 Although sawflies may look like caterpillars or slugs, since they are not, it makes a difference in what chemical are effective against them – for example, BT or Bacillus thurningiensis only works against true caterpillars and is ineffective on sawfly larvae – so be sure to read the label before using any insecticide. 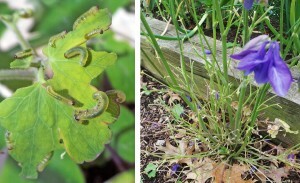 Insecticidal soaps, neem oil, and many synthetic insecticides can be used to control sawflies. 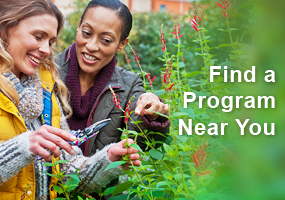 Apply insecticides only when larvae are actually present. A colony of European pine sawfly. European pine sawfly, Neodiprion sertifer, is found on various pines, especially mugo, Scot’s, red and jack pine. The striped, gray-green larvae with a black head and legs grow up to an inch long, feeding in groups only on the previous season’s needles. They will strip one branch before moving to another, and will even leave a tree in search of others if all the old needles are eaten. Since the new growth is never eaten, European pine sawfly seldom kills trees, but repeated defoliation slows growth and ruins the appearance of trees. This species overwinters as eggs laid in the needles, with larvae emerging in mid-May. Adults emerge in the fall to lay eggs on the current season’s growth near the ends of the branches. Roseslug sawfly, Endelomyia aethiops, is a Eurasian species only found on roses. The light green larvae with orange heads grow to about ½ inch long as they feed on the upper leaf surface from mid-May through June, leaving only the leaf veins. They secrete a slimy substance over their body surface that makes them resemble small slugs. They overwinter as prepupae in the soil. The adults emerge in spring to lay eggs in the leaves. There is one generation per year. 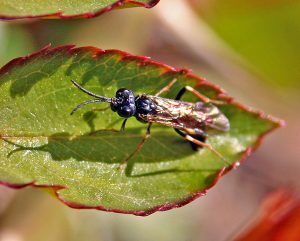 In addition to this species, there are two other sawflies that can be found on roses in Wisconsin. The bristly roseslug sawfly, Cladius difformis, has bristle-like hairs covering the body and can produce two to six generations per year. The curled roseslug sawfly, Allantus cinctus, curls up the body when at rest and generally has two generations per year. Slimy black, slug-like pear sawfly and damage. Pear sawfly (pear slug), Caliroa cerasi, is another Eurasian species which is fairly common on pear and apple trees, but can also occur on plum, cherry, cotoneaster and hawthorn. The shiny olive-green larvae are slimy and slug-like, up to 1/2″ long when full grown. They begin appearing in early June and feed for about a month on the upper leaf surfaces, leaving only the leaf veins, before dropping to the soil to pupate. Heavily defoliated trees appear scorched and leaves may drop prematurely. A second generation can begin in early August. 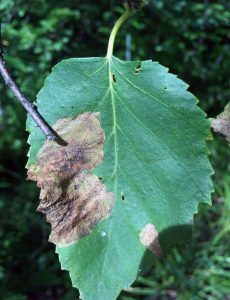 Birch leafminer, Fenusa pusilla, is a European species common on European, white, gray and paper birches, but yellow and river birch can also be affected. 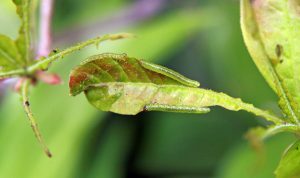 The small, flattened white larvae form small, blistered translucent spots on new leaves as they feed between the upper and lower surfaces. Those spots turn brown and papery and the leaves eventually drop off. Most people don’t realize the brownish patches on leaves are even caused by an insect, let alone a sawfly. This is usually just a minor cosmetic issue. Once the larvae complete their development they drop to the ground to pupate in the soil, going through 3-4 generations annually. Elm Sawfly, Cimbex americana, is a native species which feeds preferentially on elm and willow, but sometimes attacks maple, cottonwood, poplar, birch and other trees. This is one of the largest species of sawfly in North America with full-grown larvae ranging from 1½-2 inches long. 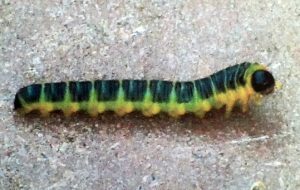 The white, light gray, yellow or light green (and occasionally pink) larvae with a rough, pebbly texture have a black stripe running down the top of the body with a row of black dots (spiracles) on each side. They often curl up into a circle when not feeding on the leaves. Usually defoliation is localized to a single tree or group of trees and since but they are feeding late in the season this rarely causes serious damage to the trees. They drop from the tree to overwinter and pupate in the soil. There is only one generation each year. The robust adults are more distinctive than most sawfly adults. They are up to an inch long, black with yellow bands on the abdomen of the females, while males have a distinct white spot just behind the wings and the rest of abdomen is reddish-brown. Dogwood Sawfly, Macremphytus tarsatus, is another native species which feeds on a variety of ornamental and native dogwood trees and shrubs (Cornus spp.). The larvae, which feed on the leaves through the summer, are black, with yellow bars across the back and solid yellow underneath, but often appear white because of a powdery white waxy coating that covers them except during the last instar and following each molt. They can cause quite noticeable defoliation of dogwood shrubs but don’t kill the plants. The larvae drop to the ground to overwinter in cocoons made of rotted wood. If the appropriate material is not found on the ground they can invade wood fiberboard or siding of buildings, which may lead to woodpecker damage. damage can be dramatic (R). 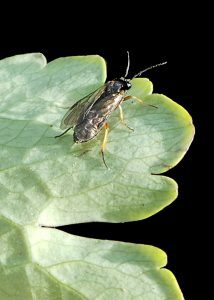 Columbine Sawfly, Pristiphora rufipes, is a European species which feeds on columbines. 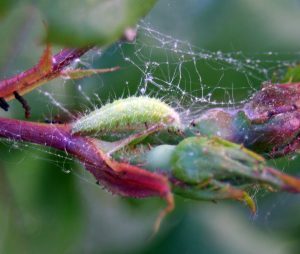 The small green larvae with dark heads eat the leaves, consuming everything but the midvein, as they grow up to about ½ inch long. They larvae drop off the leaves to pupate in brown, oblong cocoons amid leaf litter. There is only one generation a year in the upper Midwest. The damage can be quite noticeable the way that the stems get entirely clipped off, but plants usually recover, putting out a second flush of leaves. Mountain ash sawfly, Pristiphora geniculata, is a European species found only on mountain ash and is the most common insect pest on this tree. The pale green-yellow larvae with black spots and a black or orange head grow up to ½ to ¾ inch long. 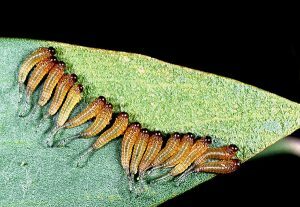 The larvae feed in groups and eat entire leaves, leaving only the mid-veins, defoliating an entire branch before moving to another. They overwinter as prepupae in the soil, with adults emerging beginning in early June. 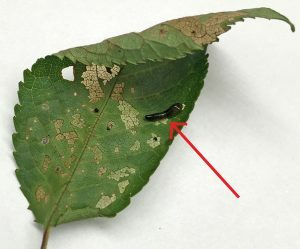 Larvae of the first generation can be seen from mid-June through early August, while second generation larvae are usually found in late August or September. Dusky birch sawfly, Croesus latitarsus, is a native species only found on birch. The yellow-green with black heads and black blotches on their sides grow up to an inch long. They feed in groups around the edges of leaves. This species overwinters as prepupae in the soil, with adults emerging in spring to produce larvae which feed from May to early July. A second, overlapping generation may occur and feed through September. Scarlet Oak Sawfly, Caliroa quercuscoccineae, is a native species which attacks several types of oaks but is most common on northern red oak and pin oak. 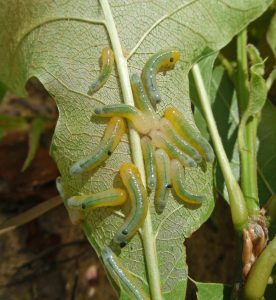 The slimy-looking larvae feed in groups on the lower surface of the leaves, leaving only a fine network of veins which gives the leaf a transparent appearance. The damage (skeletonization) is not usually widespread but can be significant and quite noticeable on single trees but rarely affects tree health except on small, newly transplanted and stressed trees. Natural enemies usually keep the populations in check, but if not, the defoliation occurs late in the season so control is rarely necessary. Pine catkin sawflies, Xyela spp., are odd sawflies and one of PJ’s favorites. The adults of these native species are tiny gnat-like creatures and are unlikely to be noticed. As the common name suggests, the larvae live in male pine catkins and drop from the catkins prior to pupation. At the right time, this can be very noticeable when tiny whitish larvae rain down from trees over decks/patios in spring. 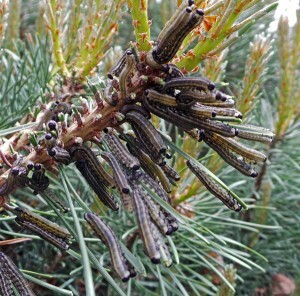 Naturalist Charley Eiseman has written about this interesting phenomenon on the BugTracks Blog at https://bugtracks.wordpress.com/2013/06/03/larvae-raining-from-pine-trees/. White pine sawfly, Neodiprion pinetum, is a native species generally found on eastern white pine. The pale yellow larvae have four rows of black spots and black heads, growing to an inch long. The single annual generation feeds on both old and new needles from late June to early August. When the larvae reach maturity they drop to the ground and overwinter as prepupae in the soil. Adults lay eggs in the needles in the spring. I have a 7′ tall Black Pine that was almost totally defoliated by sawflies. I’m wondering about how to prune it to encourage new growth – if possible. Any suggestions? I am presently working on a book for Master Gardeners discussing the various mouthparts that insects have, how they work, what they eat, the plants they frequent and how to deal with each insect without using pesticides. 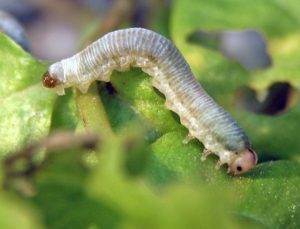 This article was very helpful in identifying the various types of sawflies both in the adult and caterpillar stages. The photos are excellent but I do not see the name of the photographer. I have added this article to my resources. Thanks P.J. Liesch and Susan Mahr. My ferns have been eaten to the vein for the past 3 yrs. I’ve tried seven,and eight but no luck. I haven’t actually seen any bugs, but when I water flies come off of the plants. I thought they were house flies. How do I treat the ferns,and ground? 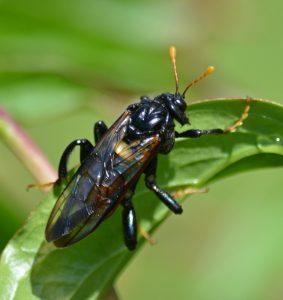 I can’t say that I was familiar with the sawfly, but this article was really helpful in understanding what type of insect they are, how they live, and what they do in the garden. I will keep my eye out this summer for them. As far as I know I haven’t had any problems with them. We had European Sawflies on our Mugo pines for two years. They ate all of the previous year’s growth and the new growth looked ok. The pines were about 8 years old, close to 3 feet tall. For the past 2 years they have not been a problem, probably because the wrens and other birds in our yard fed them to their young. I feel lucky that the scarlet oak sawfly has not found our pin oak. Interesting to see what the adults look like. I have certainly seen them, but have not known their identity. MN article also interesting and helpful regarding control. I now know what I have had on my roses – the rose slug sawfly. 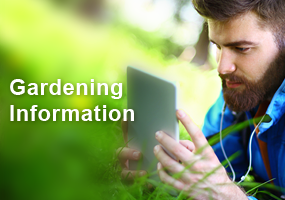 It is amazing that there are so many varieties that attack specific plants or trees. I would like to see a group rear up when disturbed? Sawfly caterpillars invade my red twig dogwoods every year. As a Pa. MG I’m well aware of the importance of maintaining pollinator-friendly habitat. Are sawflies considered a useful pollinator? I have seen needles with yellow spots on our pines up north and never knew what the cause of the discoloration was. Now I do! Glad to know that they cannot devastate our pine plantation. I have seen some of our birches with damage as shown above. I didn’t examine the leaves closely; just assumed it was some kind of scald. Hi! I live in South East Saskatchewan. We have sprayed our cotoneaster hedges with malathion three years in a row when we spot the pests in the pearslug phase. We have almost entirely wiped them out! Before we knew what was disturbing our hedges, they would get almost cometely eaten and look terrible by mid summer. Now, they stay green and beautiful! Good luck! I never knew there were so many varieties of sawflies. Kind of scary when you see them in a group. I always think it would be nice to let the natural enemies keep them under control, but everything gets too out of whack. Adult sawflies resemble wasps but have no stinger, are short lived and feed on pollen/ nectar. They are often named according to host plant where eggs are laid/ larvae invade.The leaf eating larvae resemble caterpillars/ slugs and go through multiple instars and then drop to the ground and pupate over winter.